We are now under 2 days ( 48 hours) from the onset of wintry weather across the state. If you missed my first blog on Wednesday going over the setup we have taking shape, you can find it here: http://noapologyvameteorology.blogspot.com/2013/12/late-weekend-ice-storm.html . On that blog I I mentioned that I would wait and see what the NAM model would show once it started to get within its range since it usually does the best with cold air damming in Virginia. I had someone ask me what 12z and 00z means. In short, 00z are the late night and the 12zs are the early afternoon weather model runs. On to the models. Here's the 12z nam. I know some might say its not yet within its "best" range as a model...which is usually once we get to within 48 hours of an event, but it is at least worth noting that the model has come in much warmer than it was during its 00z run last night. In each image, left panel is the precipitation while the right is the 2 meter temperatures. I highlighted in white where the 32 degree line is. There are a couple of things to take away from the NAM. Notice that the freezing line sets up mainly west of the I95 corridor. Another thing to note is once the warm front moves through, most of the steadier precipitation sets up along and north of I64, while south of there sees more showery stuff. It will be important to see exactly where this occurs because the models have been showing this to varying degrees over the past few days. Now here's the 12z gfs. The GFS is much wetter for VA because the warm front doesn't surge as far north, allowing the best lift to remain over the area. It's also a tad bit colder than the NAM, keeping the freezing line just right around Richmond to east of Fredericksburg for the majority of the event. Now I mentioned it yesterday but it's worth repeating. With the warm front moving from south to north across our area during the day on Sunday, a warm nose at 5-10k feet of around +3 to +5 degrees C with work in. I'm banking on water droplets warming enough that they struggle to refreeze in a lot of areas that are borderline freezing at 31/32 degrees...especially after recent warm weather and warm ground temperatures. I think this will limit this from being a crippling or historic icing event. With that said, some of the colder areas along the Blue Ridge are going to be in the upper 20s for much of the event. Those are the areas I would be more concerned with. Here's the sounding for Richmond from yesterday that shows what I'm talking about. Now taking a look at how warm it is only 2 days before the event, here's Friday's high temperatures across the state. These cannot be ignored. The air mass that moves in will be very cold, but not so drastically cold that these warm temperatures leading up to the event won't make a difference. 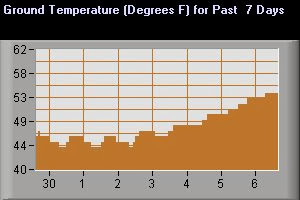 Here's a look at what surface temperatures have done over the past 7 days in Glen Allen, VA. Safe to say that this stretch of warm weather has really warmed things up. Of course, western areas aren't quite this warm and will surely drop once this cold air mass moves in, but it will certainly be a pretty big deterrent for any kind of historic event. You can see that the mean SREF temperatures for ares from Richmond to Fredericksburg and points south and east are going to have a tough time staying far enough below freezing for this to be a significant ice storm. Areas farther north and west, closer to the Blue Ridge, such as Roanoke and Charlottesville are a good bit below freezing for most of the event. Once you get into the Valley locations such as Staunton to Winchester, that is where freezing rain may fall with temperatures in the upper 20s. This is where I'm most concerned for the more significant ice. Onto the Canadian model (the CMC). I believe this is the model that has has been overdoing the cold over the past few days. Even it too has now come in a little bit warmer. On the left is the current 12z run, while on the right is last nights 00z run for the same time frame Sunday 7pm. And here's the Euro which has been very consistent over the past several model runs. I once again highlighted the freezing line at the surface in white, which is pretty good agreement with the NAM. Here's my best guess at start times during the day on Sunday, there's still some spread in the models exactly when it starts so I'll be sure to keep this updated as we get closer. As for accumulations, here is what I'm thinking as of now. I am not on board for the crippling or historic ice storm idea that I've seen tossed around. I do think this will be a significant event, with power outages scattered about, especially along the Shenandoah Valley and east of the Blue Ridge Mountains north of I64. I've said this countless times on here but it's worth saying again: any amount of freezing rain is a bad thing. Be extremely careful if you're out in about during the day on Sunday since icy roads usually just appear to be wet. 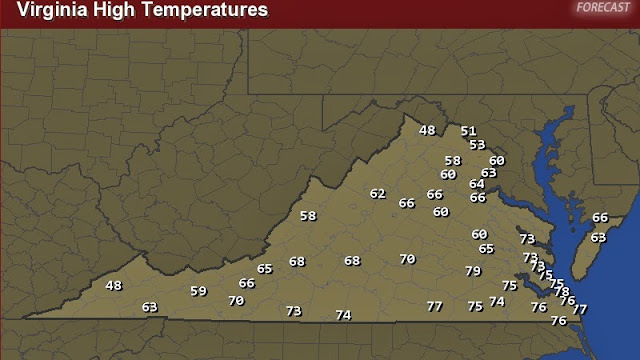 Thanks to Kenyon Gladu, a fellow VT meteorology student here at VaTech, for creating the map. I'll have a final update Saturday night if anything changes, plus more on a system that might try to develop along the stalled front early to mid next week. Great write-up as usual! Thanks for keeping us informed!